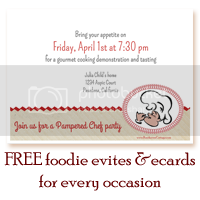 This recipe is written in fountain pen and may be Esther's handwriting. The number in the upper right corner written in pencil appears to be "67". 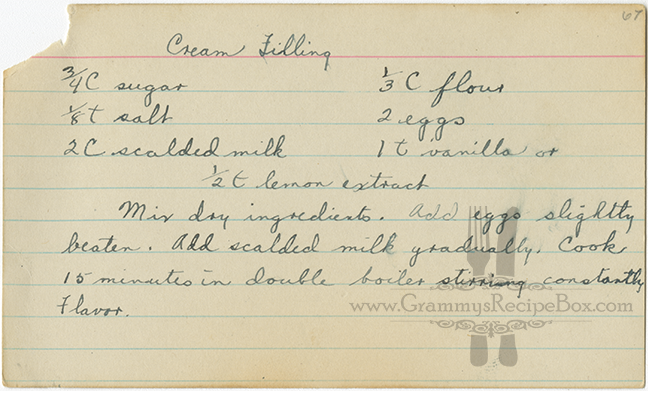 This recipe certainly predates 1967 so this could be the date that Grammy made it later. 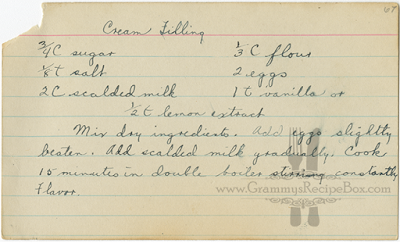 This appears to be a versatile recipe for cream filling to be used between cake layers or in pastries. I noticed that this cream filling can be made to be vanilla flavored or lemon flavored depending on the last ingredient. I suspect that many other flavors could be made by swapping out that last ingredient. I'd be interested to know if any of you come up with some yummy alternatives.